The New Your Times is reporting Deepening Cycle of Job Loss Seen Lasting Into ’09. Plummeting home prices have in recent months eliminated jobs for hundreds of thousands of people, from bankers and real estate agents to construction workers and furniture manufacturers. Recent indications lend credence to the view that the job market is in the grip of a sustained downturn. Three weeks in a row, new unemployment claims have exceeded 380,000, a level generally associated with recession. Construction spending fell in May. The University of Michigan Consumer Sentiment Survey, which tracks attitudes about business and personal finance, has dropped to a depth last seen in 1980. With job losses growing and working hours shrinking, many paychecks are eroding, prompting millions of families to cut their spending. Soaring prices for food and gasoline are overwhelming modest wage gains for most workers, leaving households with even less money to spend. All of which deprives struggling businesses of sales, prompting them to shed more workers, sending the cycle down another turn. This is how downward spirals start, and it was entirely predictable. Commercial real estate follows residential with a lag. Now that retail stores and restaurants are cutting back, it is finally dawning on mainstream media that the Shopping Center Economic Model Is History. I have been asking for well over a year "Where is the driver for jobs once Walmart (WMT), Target (TGT), Pizza Hut (YUM), and Starbucks (SBUX) stop aggressively expanding?" The answer, which I knew, was "Nowhere". The only bright spot in the economy has been small businesses. Now, even the ADP Small Business Report shows the last bastion of overall strength on the verge of contraction. 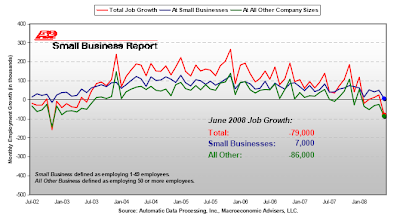 The above chart tells the story of weakening small business employment. Service providing small businesses are still doing OK, but in aggregate, small business employment is barely expanding. Medium and large businesses are nothing short of a disaster. Add it all up and things look bleak. ADP forecasts another 79,000 jobs will be lost in June. The above chart shows how small businesses have been leading the economic expansion since 2002. Small business employment will soon be contracting in my estimation. By the way there have been a number of what one might call "huge misses" of ADP job totals vs. the BLS reports that come out the first Friday of every month (Thursday this month because of the holiday). Note however, that ADP is based on actual job data, while the unemployment numbers from the BLS are distorted by the infamous Birth/Death Adjustment series. I recently talked about the BLS Black Box and Birth/Death Adjustments in May Jobs: Unemployment Skyrockets to 5.5%. It is hard to say who is missing and who isn't, and it is likely both are. No models are perfect. ADP does seem to be in catch-up mode at the moment, which is a bit hard to swallow given the nearly insane upward bias in in the Birth/Death Adjustment series. The important point now is that both the ADP and BLS models are showing a contraction in jobs. One thing is sure: The small business series is going to be interesting to watch going forward.